So let me start with the cons of this book. Oh wait. There weren't any (hence the title of this post). I was saving this book for our school's prom night since I wasn't going - I was looking forward to the irony of me staying home on prom night, reading a book that starts out at prom. Luckily for me, Kasie West did not disappoint. I had a great time at home reading this beautiful, beautiful book. There was one problem though: prom was at 8:00 and I finished this book before that O_o So yeah, that's my story. Now let me get on to why this book made my heart happy and my cheeks wet. The guy (aka Hayden). I fell in love with the love interest Hayden from the sentence in which readers are introduced to him. We meet him on prom night reading in a car, with mussed hair and glasses. He's ridiculously adorable, and in my case at least, it was love at first sight. The second thing I love about him - but did not find out about until later in the book - is that he's in theatre. I went to Stratford a few weeks ago and watched a live performance of Hamlet, and now every time someone mentions theatre I go crazy. That plus Hayden's wonderful acting skills are just the whipped cream on top of the wonderful person he is. The character development. When I first started reading The Fill-in Boyfriend, I didn't exactly love the main character, Gia. Yes, her boyfriend just broke up with her, but 1) he was too old/mature for her, and 2) he made a few good points on why he was ending their relationship. She cared more about how she appeared to her friends than how she actually felt, and that definitely isn't a trait I appreciated. However, the further you read, the more you come to realize that one should never be too quick to judge - there's nearly always a reason behind the way a person is. Seeing Gia become a better person as the story went on was a wonderful thing to see. Besides, Gia being Gia in the beginning wasn't her fault. After all, as Hayden's younger sister said, she just clueless, not intentionally mean. The relatability. I knew this was going to be a fluff contemporary, and it was, but what I did not expect were the tears that came running during a certain part of the novel. There's this one scene where a certain character critiques humans and social media, and while it's not some abstract concept, it still hurt. It was wonderfully written, and let's be honest, if you're reading this right now, you probably use social media. The author made some amazing points through that one moment, and while it may not apply to everyone, it still makes you think a bit. Then there's also Gia's cluelessnes - everyone can relate to that, no exceptions. Nobody knows everything, and sometimes it can come as a surprise how many people your everyday routine affects, and sometimes hurts. It's an eye-opener. The idea (of a fake date). I may not be a fan of the instantaneous love angle, but I get aboard of lots of other angles, and fake dates is one of them. The idea of two people fake dating each other and falling in love has always been one of my favorite romances. I see a lot of this in the New Adult and Adult genres, but this is the first I've heard of it in Young Adult - I'm glad to say it worked out wonderfully. The faults. This may be terrible of me but I adored that nobody in this book was perfect, not even Hayden! I mean, it was pretty darn close, but he did have a fault after all. The great thing about faults is that in books, readers get to see characters overcoming their faults, and that's exactly what Gia did (as I mentioned before), as did Hayden. And oh, how I loved seeing those two overcome their faults and come together despite them - I realize that sounds totally cheesy, but what can I say? This book, guys! The author. 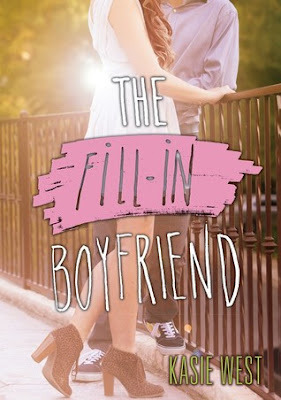 Kasie West is one of my trusted authors: I've never hated anything she's written, and I'm glad to see that tradition continue with The Fill-in Boyfriend. This is actually my first contemporary by her, but if this is anything to go by, the rest must be amazing as well. I'll have to check them out soon! The Fill-in Boyfriend is a great book for when you want something that's total fluff but still has depth to it. It's the perfect beach or summer read, and now is the perfect time to check it out. Book Synopsis: When Gia Montgomery's boyfriend, Bradley, dumps her in the parking lot of her high school prom, she has to think fast. After all, she'd been telling her friends about him for months now. This was supposed to be the night she proved he existed. So when she sees a cute guy waiting to pick up his sister, she enlists his help. The task is simple: be her fill-in boyfriend—two hours, zero commitment, a few white lies. After that, she can win back the real Bradley.